Officially, we are Tripoli Rocketry Association Prefecture #65, also known as Tripoli East NC. 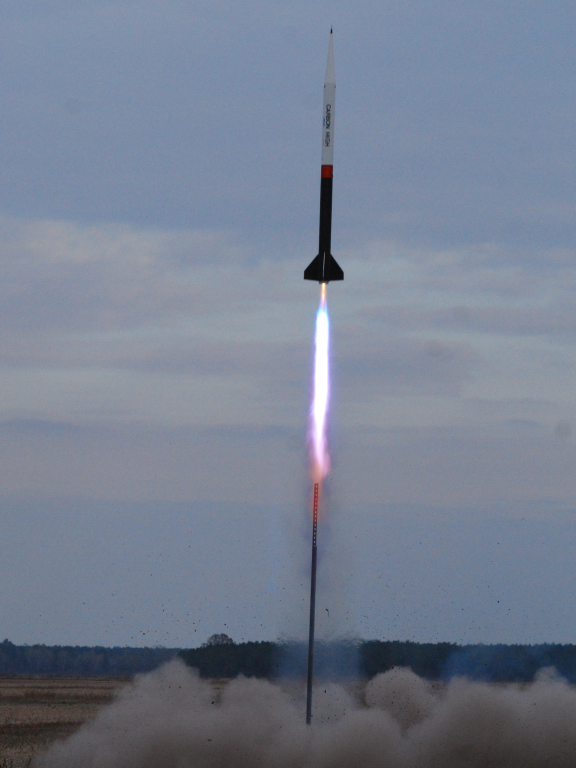 We welcome all amateur rocket enthusiasts, children and adults, flying motors of all sizes from 1/4A through O. We have several click 2- and level 3-certified members of both the Tripoli Rocketry Association and the National Association of Rocketry on site at most launches, and we can assist in certification flights for high-power rocketry enthusiasts who are members of either national organization. Our main launch site is on the Paul farm in rural Pamlico County, near the town of Bayboro, in eastern North Carolina. There, we have 3,800 acres with no trees, no power lines, and one 2-lane public road. We have an FAA waiver to use 17,500 feet of airspace. There is no finer rocketry venue on the east coast. We hold monthly launches at Bayboro from September through April. When the fields in Bayboro are filled with crops, we hold our monthly launches at the Butner Beef Cattle Research Facility, north of Raleigh. These launches are non-waivered, which means that the rockets must weigh less than 1.5 kg and fly with motors containing less than 125 gm of propellant. The Butner launches usually are held from May through August. Spectators are welcome at all of our launch events. When we’re not flying, the ncrockets e-mail list is available to get the latest news, ask for help, or share our rocketry successes with each other. Alan Whitmore is the current prefect of Tripoli East North Carolina. Dave Morey is currently managing this website and the e-mail list. This entry was posted in Launch Reports. Bookmark the permalink.